Thanks to Zephyr, translations are available for your reading pleasure! *Note: There are several repeat questions from other interviews which have been omitted for convenience. -Recently, a variety of information has been revealed from the latest footage. Many fans were surprised from the announcement of the release window “2018”. Nomura: I had no choice but to be cautious for the announcement of the release date. Therefore, it is just the year but the release window is fixed and we're working towards that. I wanted you to have a peace of mind with that announcement. –To suit their appearance according to the world, Sora and the gang have changed into toys. Nomura: The design progress it took to make that appearance was long. I’ve tried to make it look like a figurine and I’ve explored various ways of stylizing the graphics into a 3-dimensional bit image. –In the battle scene, Sora, Donald, Goofy, and in addition to Woody and Buzz made it a five-team party? Nomura: In the footage, there are five people fighting at the same time. Depending on the world, it’d be possible to fight with up to 4 or more people with guest characters. Teaming up with others is also possible and please wait for the next report regarding the party system. –With Sora being toy sized and battling outside the house, the world felt large. Nomura: With that size, it’s not possible for them to go anywhere far (laughs). The main area in the Toy Story world is the toy shop. The footage showed a toy shop called “Galaxy Toys” which is such a large area. –There are situations where Sora fights inside a robot. Nomura: The idea of controlling a robot has been around during early development. There are different types of robots you can board and each of their fighting styles are different. There is another gimmick on another floor. –In Olympus, there is an impressive battle between Rock Titan, and there seems to be more variety of elements in each world. Nomura: We were pretty conscious about it while making it. Even in KH0.2 Birth by Sleep -A Fragmentary Passage-, I believe the maps have expanded platforming-wise and there is a need for exploration. KINGDOM HEARTS III has fewer Disney worlds than KINGDOM HEARTS II but the quality of each world is greater than in previous works. –In KINGDOM HEARTS II, after visiting each world once, there was a scenario incentive to revisit them but what about KINGDOM HEARTS III? Nomura: I personally liked having to revisit the worlds twice but KINGDOM HEARTS III has a different flow. –Keyblade transformation is one of the main features in KINGDOM HEARTS III, and in this video, we see the transformation of the drill and hammer. Nomura: The Keyblade can transform into various shapes. In any case, the drill is very lovely (laughs). –Can the drill and hammer only be used in the Toy Story world? Nomura: It’s not restricted to the world but its ability is from the Keyblade obtained in the Toy Story world. Essentially, every Keyblade is capable of transforming and the Toy Story Keyblade transforms into the drill and hammer. And in KINGDOM HEARTS III, the Keyblade and Form are systematically attached together. Nomura: In KINGDOM HEARTS II, you could decide which form to switch into during battle but this time, forms activate when you transform your Keyblade. –Are there forms as many as the number of Keyblades? Nomura: Actually no. Each Keyblade has an attributed type such as attack or defense and those are the forms that exists for each type. You switch into the form while transforming the Keyblade. By the way, the series’ iconic Keyblade Kingdom Key changes Sora into Second Form (Tentative Name) w/ KH2 color scheme but this form is exclusive to Kingdom Key. The Keyblade doesn’t transform but your tactics change. Some forms are specific to certain Keyblades. –Fighting with the Keyblade transformations, it seems pretty fun. Nomura: Regarding battle actions, everything is pretty elaborate. Like I mentioned earlier, the transformations are unique to each Keyblade. When using the Olympus Keyblade, it transforms into a shield. Also, in the recent footage, arrows and a bazooka were used alongside each other. Once you acquire the Keyblade, you can immediately start using the abilities seen in the footage. –In the battle scene in the Toy Story world, Sora seems to be in a new form? 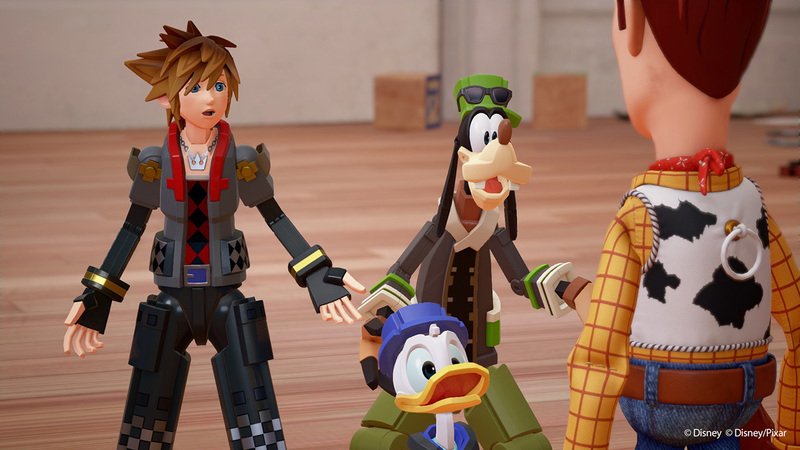 Nomura: Even in the Toy Story world where their appearance reflects the world, so does the form. In the footage, when you use the drill and hammer, the form also changes. –From the previous E3 footage, there’s a cutscene in Twilight Town. It seems to be an important world again. Nomura: Twilight Town is a place where you’ll have gameplay tutorials and it’ll be one of the earlier stages. –In the recent E3 footage, there was some interesting dialogue about Roxas and I’m concerned about the development of KINGDOM HEARTS III. Nomura: Because there are too many characters that are appearing, the storyline has become complicated. There are quite a number of main characters that have appeared in the series, and every character will appear in some form. –Will KINGDOM HEARTS III be able to solve all the mysteries concerning certain characters? Nomura: The final chapter of the Dark Seeker Saga will form their conclusions. –In the recent footage and the previous E3 footage, what is the meaning behind the quote? Nomura: “Don’t assume your dreams are just fantasy. If you can imagine a world, believe in it…and dive in.” was it? It means: “jumping into an imaginative world without dreaming of it being fantasy.” That is a catchphrase for the promotional trailers. It doesn’t necessarily have a deep hidden meaning involved with the storyline. Since the recent footage began with Sora’s dive scene, I tried to convey such a message. –For smartphones, KINGDOM HEARTS Unchained Chi was renamed as KINGDOM HEARTS Union Cross. What was the intention of changing the title? Nomura: Since we were implementing multiplayer, we’ve decided to change it and present it as a renewal of the title. One of the reasons was the new story expansion focusing around the Union Leaders. –During the time of KHUX’s re-release, many people were surprised Ventus was revealed as the third Union Leader. Nomura: KINGDOM HEARTS Union Cross draws an important development in the series, so I’d like for you to play it now. Blaine recently appeared as the fourth Union Leader and the fifth person will appear in the Main Quest updated in August. –Finally, the new five Union Leaders gather together. Nomura: That’s right. After the gathering of the five, the main storyline for Union Cross starts to progress. –In the event of the gathering of the Union Leaders, Ventus made remarks such as “stray” and “ranking” and I felt like I could relate (laughs). Nomura: I did not mean to have such “meta statements” but I’ve intended to show that Ventus wasn’t using a special Keyblade. –Nomura-san, how far into the future will KINGDOM HEARTS Union Cross still be considered? Nomura: I’ve thought of a rough story concept in advance. But for now, I will continue to make connections to the main storyline. –Nomura-san, for KINGDOM HEARTS Union Cross’ scenario, events, and raise draws, how much are you involved with those? Nomura: I always direct the scenario, design, and game system. Regarding ordinary management work, it’s left to the management team. We frequently discuss and consult about developments for the distant future. –Do you have any plans to celebrate the 2nd anniversary in September? Nomura: Time sure flies. KINGDOM HEARTS Unchained Chi will be reaching its second year. For the anniversary event, naturally I’ll continue to add to the main scenario and new elements so look forward to it. Nomura sure loves to heavily emphasise the importance of Union X alongside Kingdom Hearts III. I'd be more invested if the story wasn't so bitesized and filled with filler, the treatment of the game by Square Enix's North American subsidiary isn't helping things either. Are there forms as many as the number of Keyblades? By the way, the series iconic Keyblade Kingdom Key changes Sora into Second Form (Tentative Name) w/ KH2 color scheme but this form is exclusive to Kingdom Key. The Keyblade doesn't transform but your tactics change. Some forms are specific to certain Keyblades. Eyyy, I like the sound of that. Seems like a good way to do it! Not sure about this, though. I'm a fan of progression and upgrades, so getting all of those abilities right off the bat is a bit lame. Man it's like he's answering all my concerns about KH3 now xD Less Disney worlds than in KH2, the balancing of all the different skills sound better than I feared and everything seems optional. I was worried the game would be way too massive, but no second visits either? Quality over quantity, I'll take it anytime. The party system sounds interesting too, looking forward to hearing how they're planning to let you handle a party of 5. This game just keeps looking and sounding better all the time. Still so happy about the tutorial. Yess. I was worried the pacing would go full DDD and throw you into the game with no chill, but it seems I get my wish. Worlds in KHIII will have a different flow hey? Hmm I liked the idea of revisiting worlds hopefully this new flow is greater than that. I found it very interesting how he mentions Twilight Town being an early world. I would like to be able to visit it and compete in a few more struggle tournaments haha. Seems like a lot of work has gone into this title and I sure hope this game is amazing. I have high expectations which might not be the best idea but I am struggling to bring them down. Some people might know what I mean. I can't wait to hear more about this absolute beast of a game! I'd also love to hear more about end game content. Personally I would like just as much if not more content than KH2FM but the odds of that are surely slim.... At least at launch, Tetsuya Nomura has touched upon DLC in KHIII so who knows. God the hype is so real! Someone had a theory on gaf that seems plausible although still doesn't explain him being in his new clothes in twilight town. The tutorial could be Soras time gone during 0.2. When he comes back and tells them it's a secret as to where he was. Maybe we start the game off with where he was in twilight town, and then jump back to Olympus. This would still require two visits to twilight town though. I dunno, if anything, my theory in where Sora visited was The Keyblade Graveyard. Assuming that the encounter with The Lingering Will (Terra) was canon, Sora visited The Lingering Will in order to understand how they resisted Xehanort. I get that Sora can't understand what The Lingering Will is saying, but he can connect to hearts and stuff, and let all that friendship business do all the talking for him. Dudesâ€¦ there can still be exceptions, like in KH1, where most worlds were only one-visits, but you did visit Traverse more than once (HUB world), or even Hollow Bastion iirc. I don't think we should rule anything out yet. I'm pretty sure he means the Disney worlds won't have other stories but the main worlds like TT, Radiant Garden and such will be visited multiple times. I personally loved the multiple visits. But I'm fine with only visiting Disney worlds once for Story especially if the story is huge. Sora talking to The Lingering Will. It's not too far-fetched of an idea. Besides, we haven't seen Sora actually talk to Terra. He's spoken to Aqua and his heart has communicated with Ventus, but there's been absolutely no vocal or telepathic interaction between him or Terra at all. I don't know that I can see him doing more than going to the Sleeping Worlds, tbh. He describes what he did as "liking to say goodbye to all his friends", so just seeing his Dream Eaters and the "secret" line being just him teasing Donald and Goofy, as he does, pretty much still fits. It is very far-fetched. Why would Sora go to (from his perspective) some rusty armor who suddenly attacked him, like, a year ago or so? He doesn't have a single reason to do so. Besides, how would he visit the LW? He doesn't know where the graveyard is, and the portal isn't there anymore. I think what he's saying is that soras visit to the lingering will that happens at the end of KH2 takes place after ddd in the timeline. Not that he's visiting the lingering will again. But it doesn't make sense timeline wise. He could have been doing something else after that though. Because there could have been an alternate gateway to The Keyblade Graveyard. Again, Sora is able to connect with the people that he meets, and especially after the episode he had about Aqua and Terra in Dream Drop Distance, visiting the Lingering Will again may answer some of his doubts. [FONT='inherit']Nomura: The final chapter of the Dark Seeker Saga will form their conclusions. Yes, maybe, but definitely not meeting up with LW. [FONT=Verdana]Nomura: The final chapter of the Dark Seeker Saga will form their conclusions. It could be that while you do get the abilities, they won't be uber powerful for a while. No transformation for Kingdom Key and only 1 form for the Hercules Keyblade is very disappointing. In pretty sure it has a second transformation. Wasn't it a chariot? Yeah doesn't every Keyblade have 2 tiers, though i'am having a hard time imagining what it's second from would be. By the way, the seriesâ€™ iconic Keyblade Kingdom Key changes Sora into Second Form (Tentative Name) w/ KH2 color scheme but this form is exclusive to Kingdom Key. The Keyblade doesnâ€™t transform but your tactics change. Some forms are specific to certain Keyblades. While my opinion on the transforming Keyblades is still mixed, I always throw the poor default Keyblade away the very second I get a new one, and most Keyblades never get used because, well, they're just not worth using, and the transformations makes them, theoretically anyway, useful, and at the very least it makes me want to actually them out. Nomura: Twilight Town is a place where youâ€™ll have gameplay tutorials and itâ€™ll be one of the earlier stages. Ah, okay then. So Twilight Town isn't the first world. Got it. And it sounds like doing tutorials are a choice. I mean, it wouldn't makes sense to do a forced tutorial after you've already completed a world or two. Kinda disappointed that worlds wont get second visits. Hopefully they put in enough post game stuff so that even some of the Disney worlds have secret bosses again. Also kinda unhappy if Twilight Town is ONLY an early stage and we wont go there anytime after that. Glad to hear transformations may have the same forms, this means forms themselves are a thing and may have a section for abilities like KH2 did. However I don't like the idea of less designed forms only because of power form taking up a design. red is pretty lame considering Sora's default outfit is already red. So far we only have colors KH2 had, I was really hoping for Green or something different. True. And it doesn't seem like he straight out says there won't be any other content in the worlds after the first visit, just that it won't be the same as in KH2. KH1 had stuff you could do in the worlds later in the game with your upgraded movement abilities and other stuff that unlocked, maybe it's something similar to that. Not a full second visit, but maybe still something to do there later on. I imagine twilight town is the second world after olympus. You learn the basics in Olympus and get through a Disney story. Then you get your new clothes and go to twilight town to start the main story. Also kinda unhappy if Twilight Town is ONLY an early stage and we wont go there anytime after that. in the orchestra trailer and he stated that that scene was late game. Each Keyblade has an attributed type such as attack or defense and those are the forms that exists for each type. You switch into the form while transforming the Keyblade. Do not like this, KB Transformations are superfluous gimmicks and they don't excite me. This is good, hopefully there are a good variety of Keyblades which have specific forms and battle style changes (gimme a magic boosting Wisdom Form 2.0 Keyblade!). Anything to deescalate the centering of transformations. RE: Union Cross being important, ehh. It seems like another redundant pastiche of ideas Nomura has combed through fan forum roleplay sections for and a pretty anticlimactic follow-up to the definitive anticlimax that was Unchained. My main concern, given its positioning of Ventus, is that it will actually impact the ongoing plot rather than sticking to unremarkable set-up for future installments I can choose not to care about at this time. Kingdom Key not having a transformation means transformations aren't canon. If Ultima has no transformation, it'll be rage. Keyblade transformation are cannon to this series. The bbs trio had their keyblades transform in their gliders. It is for sure an ability the keyblade has. 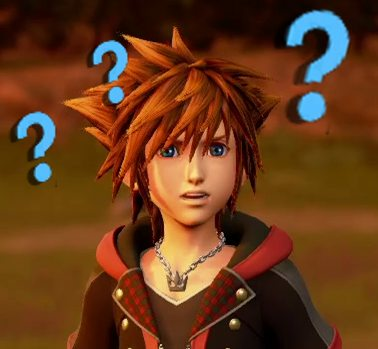 When Nomura said that KH3 will have a new format for visiting worlds, what I'm thinking, if the tutorial is still featuring a playable Sora, is that it would start us off in Olympus Coliseum and then at some brief point, we'd have to leave and head back to Twilight Town, and then once we've done whatever tutorial there is there, we jump back to Olympus Coliseum again. That said, if that's how they're going to do it for all the worlds, I'm not sure I care much for that way of storytelling. You really are angry about the Kingdom Key not transforming. Personally, I'm glad that it doesn't transform. The signature Keyblade of the franchise doesn't need any special transformations. It's just a weird change since we were previously told that "all" the Keyblades will have a transformation, and "all" was exaggerated to a great extent by Kaori. If some don't transform and just switch up your style like the Kingdom Key, I'm all for it. It would feel less gimmicky and give people plenty of options. That said, all this is only gonna work if you can switch keyblades in the middle of battle. As someone who typically runs through the KH games with the default Keyblade (BbS being an exception, if only because the base weapons upgrade fluidly into new, separate ones. I don't count Lost Memory for how drastically different it is, but that's beside the point), I quite appreciate that Kingdom Key doesn't transform in and of itself, and just gives Sora the ability to use older abilities that he's since lost because of Level reversion reasons. Why this happens is a mystery, but I'm sure someone will think of some Nomura-esque reason for it. Like... "Kingdom Key has retained the memories of skills and abilities it's wielder once used", or something out-there like that. While I'm eager to know more about the new Party system, I also want to know about the Ability system; my worry in that respect is they won't bring back the AP system from the other numbered titles, which was something I enjoyed. I don't want to have all these flashy combos by default, I want to earn those goodies! As for single visits to Disney worlds, I'm perfectly fine with that. If Nomura's word, coupled with what we've seen of the trailers, are anything to go by, the Worlds are packed full of enough content and exploration to warrant a single visit. What is everyone's current understanding of these lines? Those who play III will recognize Union X? Does this mean that the events of Union Cross will be recapped or concluded in Kingdom Hearts III? Are the Foretellers and new Union Leaders included among the many characters whose stories will see resolution in III? My personal theory is that III will include playing through a Sleeping World version of the Keyblade War in order to wake Ventus, and the events of Unchained X/Union X will be presented that way. So much for every Keyblade transforming. It's just copy pasted Limit Form. The KHII purists hate anything not KHII. They want to go backwards rather than forwards. I'm guessing you can equip 2-3 during battle to choose from. It sounds like that he's just saying if anyone is interested in getting some more of the KH story right now, as opposed to waiting for KHIII, they can play KHUX which gets monthly updates. There's also the first part of what he's saying that's just about how elements such as Luxu's black box will be referenced and maybe seen in KHIII. KINGDOM HEARTS Union Cross draws an important development in the series, so I'd like for you to play it now. â€“In the recent E3 footage, there was some interesting dialogue about Roxas and Iâ€™m concerned about the development of KINGDOM HEARTS III. I'll just go ahead and be super hopeful that this indeed means we'll see each and every one of the past Org XIII members in some manner another. Might even mean some good ol' Vanitas on top of that. I wanted to keep my hopes relatively downward for this specific concern (returning of most/all KH-original characters), but this quote seems to push in the direction of hope. UX has story elements? Where?!?! It has so much story that they couldn't even fit it into a movie adaption! Guess you have to play the game to get the full story!! Granted, they may be somewhat hard to spot between all the meaningless filler thrown in to try and milk the players for money, but UX does indeed have an overaching narrative and story elements. Unlike the old browser version though, the main story in UX proceeds with a pace slower than an escargot. Can't deny that, the Disney worlds in X/Ux pretty much serve no other purpose than as filler story-wise (in-game justification aside). You could probably just only watch the Daybreak Town stuff and still be perfectly fine. I'm sure part of the reason for Ux's slooow pacing comes from its quest and AP system, at least in Browser X story objectives were pretty much just "get from Point A to Point B, throw in a few AP points if needed" and open-world travel made this much quicker. Union X is a video game at the end of the day To get the complete experience, you have to play the "filler" content to enjoy it. And besides, despite the Disney worlds being filler content, they're arguably the best re-tellings of the Disney stories to date. You're involved in the climax of Snow White, Gaston is finally featured in Beast's Castle, and you actually communicate directly with Aurora in Enchanted Dominion. And in order to maintain player retention, you have to disperse story updates on a monthly basis. And as far as the story's pace goes, it's exactly the same as X was, monthly updates. The only reason why it finally feels slow is because you're arguably more invested in the story because Maleficent and Ventus are involved, characters that directly connect to the overall Kingdom Hearts franchise.